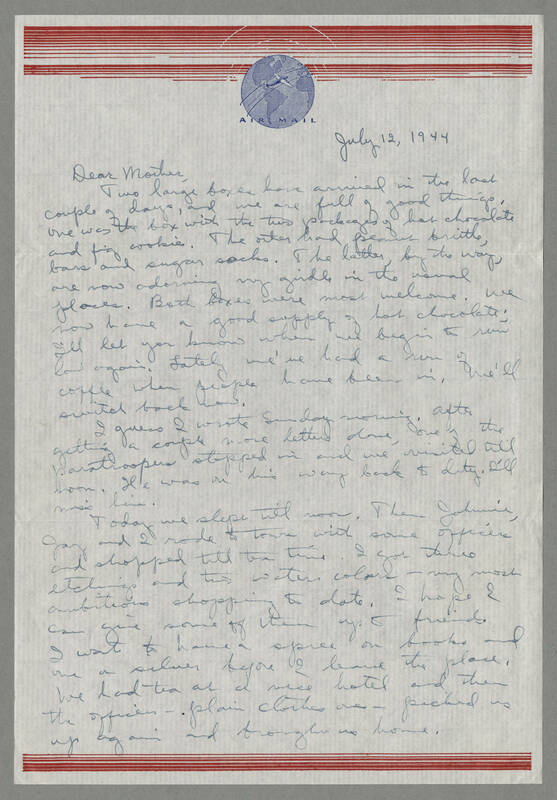 July 12, 1944 Dear Mother, Two large boxes have arrived in the last couple of days, and we are full of good things, one was the box with the two packages of hot chocolate and fig cookies. The other had peanut brittle, bars and sugar sacks. The latter, by the way, are now adorning my girdle in the usual places. Both boxes were most welcome. We now have a good supply of hot chocolate; I'll let you know when we begin to run low again. Lately we've had a run of coffee when people have been in. We'll switch back now. I guess I wrote Sunday morning. After getting a couple more letters done, one of the paratroopers stopped in and we visited till noon. He was on his way back to duty. I'll miss him. Today we slept till noon. Then Johnnie, Jay and I rode to town with some officers and shopped till tea time. I got three etchings and two water colors - my most ambitious shopping to date. I hope I can give some of them up to friends. I want to have a spree on books and one on silver before I leave the place. We had tea at a nice hotel and then the officers - plain clothes ones - picked us up again and brought us home.